Mention the word China in relation to watches and most people think of replicas of famous Swiss watch brands. But as the Chinese economy rapidly evolves, highly skilled watchmaking manufactures are beginning to evolve, developing watches that are as creative and beautifully crafted as Swiss timepieces. One such marque is LONGIO. Established in 1996, they manufacture parts, high quality luxury timepieces and tourbillons and have developed a solid reputation for the quality of their craftsmanship. LONGIO will be displaying three of their rarest watches at Baselworld next month with a series known as MCH's Art of Time. 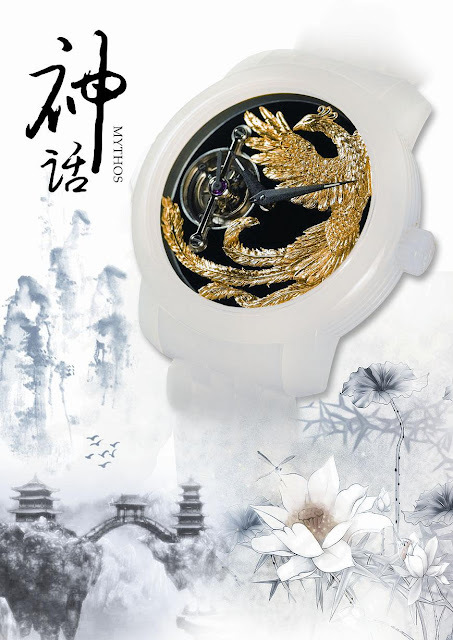 There are three watches in the collection, Mythos, National Beauty and Saluzi, each designed by Mi Changhong, the founder and chief designer for LONGIO Watch Company, express Chinese legend through highly intricate fingertip craftwork. LONGIO has become the world's first manufacture to produce a wristwatch made of pure Chinese Hotan (or Hetian) white jade - known as one of the most precious jades of all. Hetian Jade is produced in Xinjiang province, from Shache to Tashenku'ergan and from Hetian to Yuzhen. For over 2500 years jade has served as a symbol of identity, and only nobles and high court officials were allowed to wear it. Using this top quality white jade, the watch case and bracelet are carved completely by hand by masters of the jade guild. The elegant dial of the LONGIO MYTHOS is composed of pure black enamel which features a highly detailed 18K gold Phoenix, which was also crafted by hand under a microscope. In Chinese mythology, the phoenix (called Feng Huang) is the symbol of high virtue and grace, of power and prosperity. It represents the union of yin and yang. With the Mythos, LONGIO believes it has created a powerful link between mythology and mastery of timekeeping with another one of a kind horological creation. 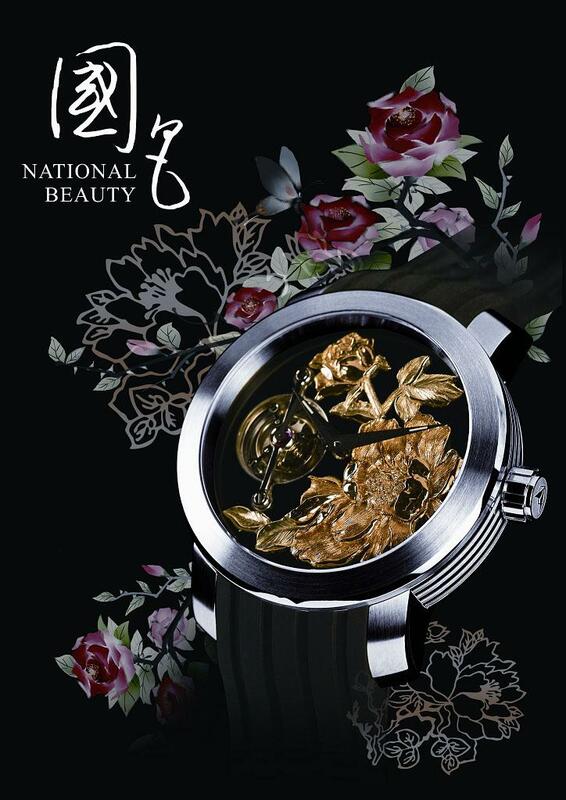 Limited to just 18 pieces, ‘National Beauty’ portrays hand crafted gold Peony flowers, which have the reputation of being of “national beauty and heavenly fragrance” and “the king of flowers”. The Peony is regarded as the symbol of luck, wealth, prosperity and happiness. LONGIO’s National Beauty timepieces feature an 18K golden red carved blooming peony on the black enamel dial, perfectly combining Chinese flower art with gold carving, enamel and other Chinese handicrafts. Again limited to just 18 pieces, Saluzi as the legend goes, was the war horse of Li Shimin, Emperor Taizong of Tang when he was fighting with Wang Shicong in Mangshan Mountain, Luoyang. Li Shi Min’s brave General, General QiuHanggong, who was accompanying the Emperor, fired arrows at the enemy cavalry to keep them at bay and once back at camp proceeded to pull the arrows from the wounded Saluzi so as to save him. 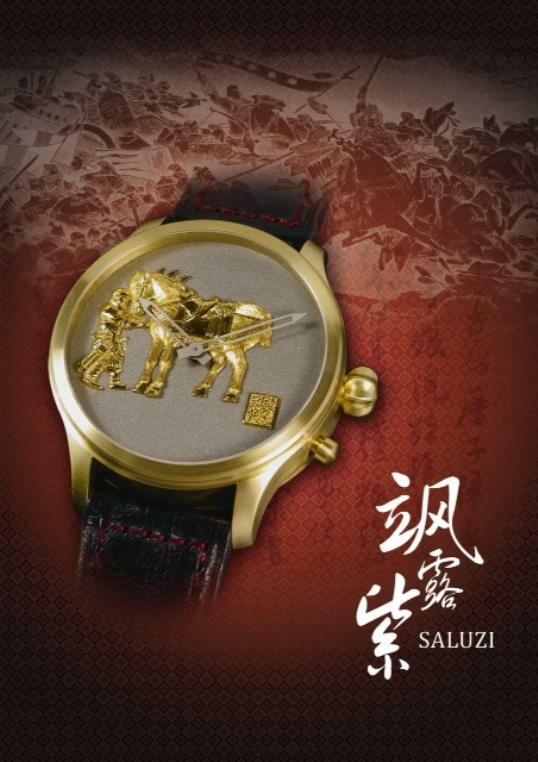 Saluzi timepieces use 22K golden miniature engraving technology to portray the emotive moment when senior general Qiu Xinggong extracted the arrow from the injured Saluzi. The watch features a rare and precious antique movement designed personally by the famous German watch creator Dürrstein in 1890. The watchcase is made of precious 18K gold.